Hello everyone! How was your weekend? Any Christmas shopping taking place? Except for a few things I am buying for my boys and their girlfriends, most of my shopping will take place in California so we don't have to pack it and take it there with us. Well these cute little elves are exchanging gifts all ready. The Signs of Santa bundle is so cute for Christmas cards. Here is today's card. 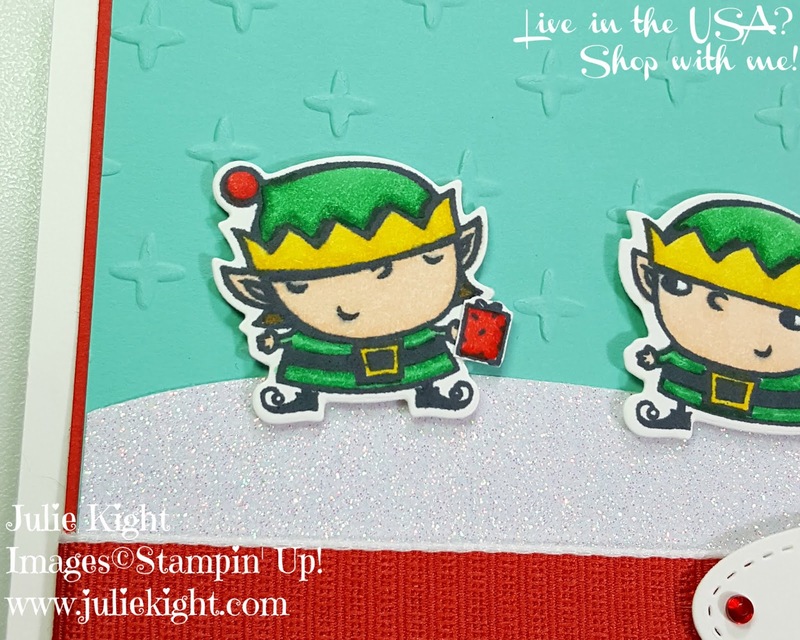 These cute little elves are so adorable! And this one is giving a friend a gift for Christmas. 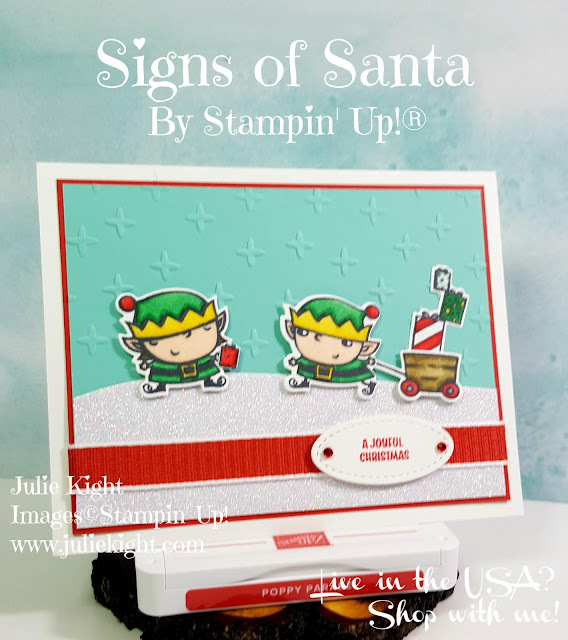 I am loving using the new Stampin' Blends to color these in. The colors blend so well together and you can get so many looks with the different ways you can use them. I used a piece of the Sparkle Glimmer paper for it's "snow" look. This paper is so incredibly amazing! It doesn't shed at all and leave little bits a glitter on you, your family, or unsuspecting friends! I also angled the one elf and his wagon to make it look like he was going up the hill of snow. 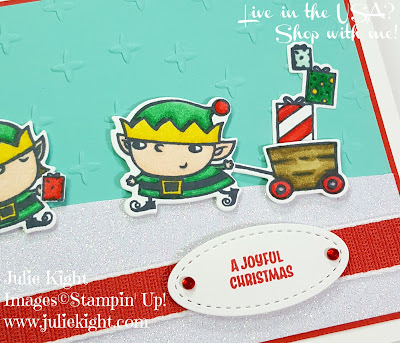 I stamped the gift packages stamp twice so that I could use one for the wagon on I could cut the other one up so I could put it in the hand of this elf. And now it looks like she is giving her friend a gift! I used the Sparkle TIEF to emboss the piece of Coastal Cabana to make it look like snow was falling in the background. 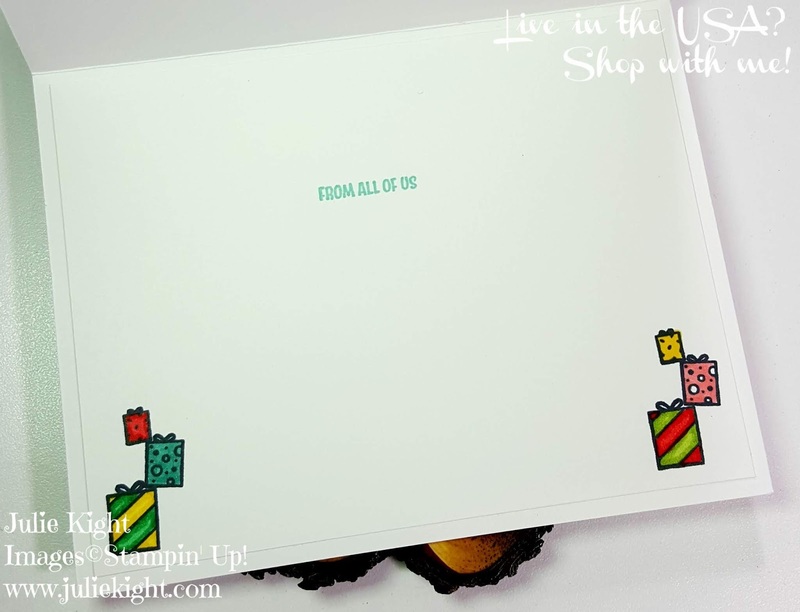 I carried the same theme inside by stamping the same gift stamp in the two lower corners and colored them in. Any family or friend would be happy to get this card from you and they would be so surprised when you tell them that you made it! I can teach you how to make something like this, just ask me how! Thanks for looking and check back tomorrow to see what my Day 4 project will be! See ya!! !